Coláiste Dún Iascaigh, were among nearly fifty clubs, schools and organisations to receive an Amber Flag from Suicide Aware for promoting positive mental health in the school, in what was the second presentation this month to Amber Flag Committees around the country. Former Munster and Ireland rugby player, and Tipperary native Alan Quinlan, gave a speech to the 200-strong crowd in the Rochestown Park Hotel, Cork, where he spoke about his journey with his own mental health. He also spoke about awareness surrounding the promotion of positive mental health. He emphasised the lingering stigma in society, and he addressed the “macho” world of rugby, and how, in his experience, there was no talk of feelings or worries, as this was seen as a weakness. He stressed the fact that speaking out about his problems, and asking for help, changed his life. While young and old have worked hard in promoting positive mental health, he commended the youth of today, who he believed are the generation who will break down the stigma surrounding mental health. He congratulated all those who had endeavoured to promote positive mental health, and paid tribute to Patricia Behan of Suicide Aware, who had been instrumental in getting the initiative off the ground over 18 months ago. Over 500 Amber Flags have been given out by Suicide Aware nationwide to date. 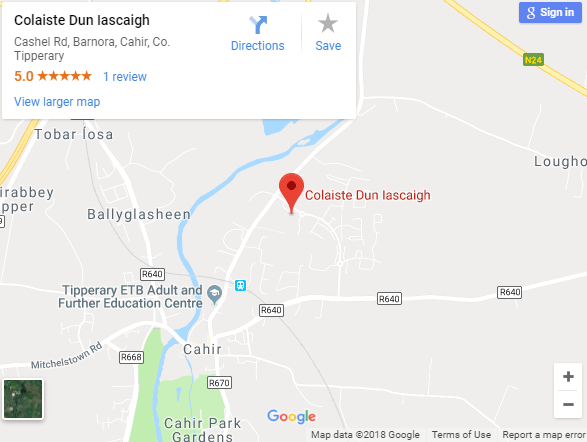 Earlier this month, Coláiste Dún Iascaigh launched its campaign with a 5K Fun Run for TY and 5th Year students, with the aim of promoting the link between physical exercise and positive mental health. Representing Coláiste Dún Iascaigh at the event were members of the Amber Flag Committee, teachers Ms. Aoife Morrissey and Ms. Mary T. O’Shea and students Cathal Boyle, Kenneth Conlon, and Caoimhe Hickey.